In this step-by-step guide, I'll show you everything you need to know about setting up online payments for your nonprofit. If you’d like to start accepting online payments right away, you have two main options to get started. Wild Apricot has now partnered with Affinipay to offer Wild Apricot Payments, our own payment processor. If you'd like to learn more, check out this page. If you want to learn more about other payment options, read on! The two options to accept online payments are through a Merchant Account, or a Third Party Payment Processor. To know which one is right for you, determine the volume of monthly online transactions you expect. For nonprofits with a very high volume of monthly transactions (hundreds or more), choose a Merchant Account. If you plan on accepting offline payments and donations via credit cards, you will need a merchant account to use a hand-held credit card reader. While transaction fees for a Merchant Account are typically lower than a Third Party Payment Processor, considerable time and effort needs to be put in up front to setup your account. I will go into the details of this in the next section. 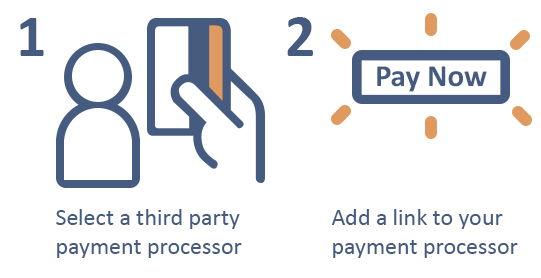 For nonprofits expecting a low volume of monthly transactions (less than a hundred), choose a Third Party Payment Processor. Typical Fees: 2.9% + $0.30 per transaction. Usually no other fees. Setting up a third-party payment system can be done in a matter of minutes, but transaction fees are higher, because you’re paying a third party to process the transactions via their own Merchant Account. This is the preferred option for the majority of small nonprofits I’ve come across, as they don’t have the bandwidth to setup or maintain a merchant account or payment gateway. To help you understand more about which option may be right for your nonprofit payment processing system, I’ve detailed them both below. A Merchant Account allows your organization to directly accept debit and credit card payments whether they are online or not. Get an Independant Sales Provider to do it for you. This option is obviously the easiest. A Payment Gateway allows credit card information to be entered directly into a form on your site. There are a number of such providers, like Authorize.net or PayPal Pro. A good provider should screen orders for fraud, and also calculate taxes into the final bill automatically. To integrate the gateway on your website, you may need the help of a web developer depending on your expertise. The link or button is the easy part — most online payment processors will supply copy-and-paste code for buttons to put on your website (like the example of a PayPal donate button in the image to the right), or a link to include in your emails and other communications. If you are willing to put in the effort up front, going with this option may be optimal for your nonprofit in the long run as the processing fees can be lower than Third Party Providers. This sort of service is generally the quickest and easiest way to set up your organization to collect donations and other payments through your website. Be aware that not all payment processors do business in all parts of the world, or there may be extra hoops to jump through for users outside North America (and sometimes for those outside of the United States). After you read the next step, I’ve provided a list of considerations and payment processor options. Once you sign up for a Third Party Payment Processor, the provider will give you a link and embed code for a “Donate” or “Pay Now” button, which can go on your website. When a payment is made, the payer automatically get a receipt by email, and you’ll get an email to notify you of the payment also. Then you can choose to withdraw the funds into your bank account, or keep them in your account with the payment processor. Just as a “brand name” product can engender trust in a consumer, compared to a product they’ve never heard of, a payment processor that’s familiar to your supporters is likely to give them greater confidence in making online payments. When you think of buying and selling online, which services come to mind as having a solid reputation? If you’re not sure what payment processor your supporters would feel most comfortable using, you can conduct a quick poll on your website or ask around at your next general meeting to get a sense of their habits and preferences. Ease of use is a huge factor — if the payment process is a big hassle for you to set up and manage, there may be an investment in time and/or tech support that’s more than you can manage right now. Further, a membership payment or donation may be abandoned before it’s completed if the process is not quick, simple, and relatively painless from the online donor’s perspective. Users will be quick to abandon a payment if they are uncertain about what they’re doing, for fear of making a costly mistake. If accepting online donations is your main goal, you may want to take a quick glimpse at our guide on how to turn your website into a donation generation machine in just six steps to make sure you’re setup appropriately. Reading the fine print, talking to a support agent, and calculating some simple math may save you money in the long run. In a TechSoup discussion of online payment processors, one nonprofit reported paying more than $100 in transaction fees for an event that brought in only $2000 — obviously a significant cost. However, another nonprofit group, Sacramento Loaves & Fishes, found a clever way to share the costs of their payment provider — they added a custom field to their donation page, giving supporters a chance to choose to pay the processing fees on their donations. This may require a greater level of technical expertise than is available to many small nonprofits on a tight budget, but it’s an interesting approach that may be worth looking into. What works best for one organization may not work as well for another, but here’s a look at a few online payment processing services, to give you a sense of what’s out there. Here I’ve listed several of the payment processors I’m familiar with and are commonly used by customers of Wild Apricot. They are in alphabetical order. To qualify for fundraising discounted fees, a Tax ID and Nonprofit Designation Form must be emailed to ProPay. See here for more details. Square also offers an easy to install app and card reader for in-person transactions. Simply plug the card reader into your phone and accept credit card payments at events. Email sales+nonprofit@stripe.com for information about nonprofit discounts. This is an alternate option that may work for your nonprofit. With Google Wallet, you can send and request money for free (app available for Android or iTunes) using just someone’s email address. If you're already a Wild Apricot customer, using our payment processor allows you to easily get support from Wild Apricot without worrying about finding another provider. If you’re a membership-based organization looking to automate monthly renewals, you will need more than a merchant account, or a third party payment processor. You will need another type of software which integrates with your payment processor and that allows recurring fees to be automated. The easiest way to setup recurring payments is to use a membership management software like Wild Apricot, which also integrates with whichever payment system you’re using. Once set up, members can opt to have their monthly or yearly fees automatically billed to their credit cards, meaning you won’t have to hound them for payments, or late dues. It can be a huge time-saver for any nonprofit. In fact, here’s the story about how one membership manager was able to save 20 hours of administrative tasks per week (including setting up automatic recurring dues) by using membership management software. And if you're looking to learn more about how a membership management system can help you create recurring payments and grow your members, I'd encourage you to sign up for our free nonprofit webinar, called The Tech Effect: The Simple Solution 1000's of Organizations Are Using to Grow Membership in Today's World. Editor's Note: This post was originally published in February 2009 and has been updated for accuracy and comprehensiveness. Wow! This is an amazing post - everything any non-propfit would ever need to know about online payments. For the http://12for12k.org project, Danny Brown uses a widget called ChipIn that integrates with paypal. This is wonderful, Rebecca. I love it when y'all do the research for me! Thanks. Right now we use Click & Pledge to accept donations, but we will begin hawking our wares online later this quarter. We've had nothing but a smooth ride with Click & Pledge, but it'd make sense to have one payment processor instead of two. I've been shopping around mainly between PayPal and Google Checkout. Google Checkout was especially attractive given that we are a Google Grant recipient, but since that discount ends in 2010, I wonder if it's worth the hassle (and the ease of use issues you've cited above) given that our online volume is currently an unknown. So, I think we're going to give PayPal a try unless an astute commenter on this blog can convince me otherwise. Thanks again! This is chock full of information for anyone needing to handle online payments, especially if you're looking for alternatives. Thanks for this comprehensive review. We use Kintera for online payments. We are able to create various payment portals (see website - Donate Now button). Our newest one which will be operational this week, will be for our upcoming cycling invitations. Each rider will have their own page for donations, complete with thermometer to show their progress toward their goal. We are thrilled with this personal donation page feature and believe it will be a significant source of donations for us this year and moving forward. I work for Network for Good and I wanted to say a quick "thank you" for including us in your comparative write-up. This is definitely useful information and you've taken a lot of the research legwork out of the process for nonprofits! I would like to make one note: The price and hyperlink you have listed are for a TechSoup annual subscription promotion that includes Custom DonateNow (CDN) and EmailNow together. New customers can absolutely sign up just for CDN: Set-up fees are just $199 and then it's $29.95/month plus 3% transaction fees. All customers have the opportunity to include a custom question on their donation page to ask whether donors would prefer to cover that 3% or have it deducted from their donation. Thanks for the additional information about Network for Good, Rebecca - being able to purchase the Custom DonateNow service separately could make a big difference to a non-profit's budget. Much appreciated! I'll update the post to reflect this information. And another update here -- I've just had a note from someone at ProPay who tells me that they do, in fact, have special deals for non-profits if you contact them to ask about it. I'm hoping to get more details on that shortly, and will pass that info along as soon as possible. I found a company, called Merchant Focus, that has special pricing for U.S. based non-profit organizations at www.merchantfocus.com They offer a merchant account and a authorize.net gateway account, with no setup fees at all. No termination fees either which I have found some of these companies try to get you with. The merchant account fees are: 2.09% discount rate for visa/mc 25 cents per transaction and a 10 dollar monthly fee. The gateway pricing is cool because they give you the 1st 250 transaction free and then 5 cents after that. "The monthly processing limits are somewhat low – up to $5,000 per month for the larger package – but we are able customize for specific needs. For example, a local chapter of a wildlife non-profit signed up for our premium plus account for regular monthly processing that would not exceed the $5,000 limit. However, they have one big fundraising banquet per year where they raise $20,000. ProPay was able to enable them to have that one big processing month. Despite the pre-packaged solutions online, we can customize to the processing needs of an organization which we have found to be more sporadic." Hi I am very interested in this topic. A major problem for our organisation at the moment is the hundreds of credit card payments we take all require an invoice to be manually generated, entered into our accounting software, and reconciled against receipts from the credit card merchant service. Does anyone know of a software that automatically creates invoices? We would love to be like amazon and itunes and email our customers an automated invoice the same day! M Osborn, thanks for the clarification. My initial thought was that a retailer service might be an appropriate way for professional associations to offer products and services to members, but I see from the "prohibited" list that 2Checkout has placed restrictions on the sale of seminar and event tickets! Not so useful, after all - I'll take it off the list. We are a small non-profit animal shelter currently using PayPal for online donations. The problem we have with PayPal is that if someone is trying to pay with a credit card and has EVER had a PayPal account in the past, PayPal will NOT accept the payment unless the donater uses the SAME credit card that they used to originally set up the PayPal account. I ran into the same problem when I tried to donate online. I couldn't remember my password, as I hadn't used PayPal in years. And, I didn't even have the same credit card I used at that time. It took me over an hour to contact PayPal, get a new password, and go into my account to enter a new credit card. NO ONE is going to go to all that trouble to make a donation. I get a report from our website host, Homestead, when we get a donation, but when I go to check out the PayPal account - It's not there. We have lost a LOT of donations because of this. I contacted PayPal and was basically told "Tough Luck" - the only way to fix it, is to do what I did. I Need an EASY, SECURE, method of collecting donations on line with credit cards AND a system that can handle montly pledges to our shelter. I am not HTML literate, and need an easy integration. That's about the only good thing that PayPal has to offer. Judy, unless your website host has an alternate suggestion for you, perhaps the easiest option would be to add a second payment option for your donors. Have a look at Google Checkout? It's far from perfect, but because of the company behind it, it is one that your less-tech-savvy donors are likely to be relatively comfortable using. review the list of countries under its jurisdiction. that this decision is final." Unfortunately I see nothing in the given link that indicates that they do not process donations for Swiss nonprofits. This leads me to believe that Paypal will likely stop processing payments for all nonprofits. I've tried repeatedly to have them clarify their stance on the matter, but they are only able to send me the same message over and over again. I thought everyone should be aware of a change in Paypal policy. Milan, thanks for the note. That certainly seems like an issue that could use clarification from PayPal, and so far I too haven't been able to find explanation on the PayPal site. I'll see if I can find anything out - and, meanwhile, I hope you'll post back here if you hear anything further? Thanks again for sharing this. Thanks for the article - I'm learning how to be more web design literate everyday, but online donations have me a little confused. This article basically summed up everything I have found online, with one exception - Amazon now offers a payment account which you can use for Donations. Does anyone have comments on using Amazon's donation button (I've looked through a lot of their reference material, and right now it seems like it would be a great asset for our website)? We are an unincorporated association. We used Paypal to collect payments and small donations, but Paypal objects if you ask for donations and are not a registered 501(c)(3). I'm not sure what you mean by "Paypal objects"...? If you are collecting donations as a charity or nonprofit organization, your account’s nonprofit status must be confirmed. To begin the approval process, submit contact information, business URL, and a brief business summary to compliance@paypal.com. The exact documents required are based on the regulatory laws for your country. We’ll contact you if we need additional information. If you have a registered U.S. 501(c) 3 organization, your charity’s fees might be reduced. Donations that are not associated with a charity or nonprofit organization are not subject to these requirements, but all donation transactions are subject to review and must comply with all of PayPal’s Acceptable Use Policies. We too have seen the PayPal horror when someone who previously had a PayPal account just wants to donate and move on. They torture that poor soul, who simply gives up. Google Checkout seems no better, forcing a registration/signup for a harried donor who does not want to give up their life to Google. Blackbaud/Kintera is not cheap, but at least works well. We'll check out Network for Good. Maybe Ticketfly would allow nonprofits?